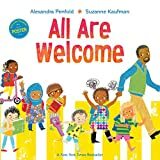 All are welcome / Alexandra Penfold, Suzanne Kaufman. Material type: BookPublisher: New York : Alfred A. Knopf, Edition: First edition.Description: 34 unnumbered pages : color illustrations ; 27 x 27 cm.Content type: text | still image Media type: unmediated Carrier type: volume | sheetISBN: 9780525579649; 0525579648; 9780525579656; 0525579656.Subject(s): Stories in rhyme | Schools -- Fiction | Cultural pluralism -- Fiction | Stories in rhyme | Schools -- Juvenile fiction | Cultural pluralism -- Juvenile fiction | Cultural pluralism | Schools | Stories in rhyme | JUVENILE FICTION / School & Education | JUVENILE FICTION / Social Themes / Friendship | JUVENILE FICTION / Social Themes / Prejudice & RacismGenre/Form: Stories in rhyme. | Fiction. | Juvenile works. | Stories in rhyme. | Stories in rhyme.Additional physical formats: Online version:: All are welcome.DDC classification: [E] Summary: Illustrations and simple, rhyming text introduce a school where diversity is celebrated and songs, stories, and talents are shared. Illustrations and simple, rhyming text introduce a school where diversity is celebrated and songs, stories, and talents are shared.